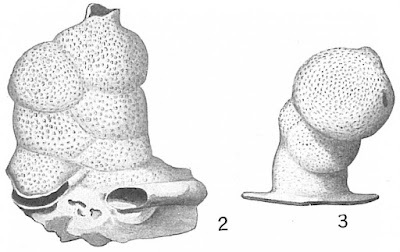 Examples of Carpenteria proteiformis, from Cushman (1921). The Homotrematidae are a group of attached Foraminifera known from the Upper Cretaceous to the present day (Loeblich & Tappan 1964b). Characters (from Loeblich & Tappan 1964b): Test attached, early chambers irregularly trochospiral, later variously modified; wall coarsely perforate. [VV77] Vervoort, W., & P. Vasseur. 1977. Hydroids from French Polynesia with notes on distribution and ecology. Zoologische Verhandelingen 159: 1–98.